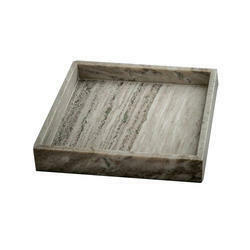 We are the leading manufacturers and suppliers of the Gold Foil Marble Tray Set. 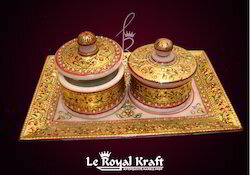 Handcrafted Utility Marble Tray Set offered features superior overall finish standards that are maintained as per emerging demands and specific tastes of customers. Providing for enhanced finish appeal, these perfectly handcrafted pieces are highly demanded for adding decor value that adds rich finish value to the surroundings. We Manufacturer and Exporter of Decorative Marble Inlay Tray Made from high quality marble these Inlaid Marble Plate have various design, shape, size and colors are used as a decorative piece or can be used as gift items. We also meet customized requirement. Our present position in the industry is chiefly attributable to our specifically designed Square Marble Tray Set from our exclusive collection of products. We are a unique entity in the industry, actively committed towards manufacturing and supplying an alluring range of Handcrafted Marble Tray. - Suitable for gifting purposes as well as used for serving at dining tables.